You need a center, a way of being in this world, so that you are not going up and down with the ups and downs of life, there’s just no power in that. Of course, sometimes life brings situations that are so shockingly brutal, you’ll need time to recover, to grieve, to process. But short of those times when we’re blindsided, betrayed, or brought to our knees, we really don’t want to be stuck in a powerless cycle of suffering. At a certain point, you have to unpack your bags if you feel you may be carting some old, heavy stuff around. The “how” is the thing for you to discover. Your “liberation pathway” is a personal process; there is no singular path to healing. 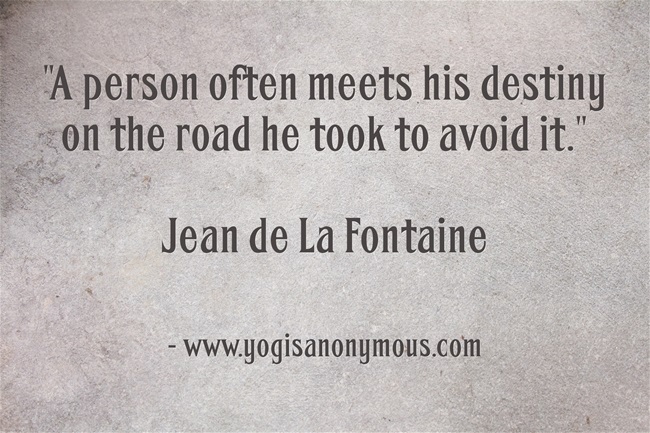 For me, discovering and practicing yoga changed my life and my way of being in this world, which is why I teach. I believe if these tools worked for me, they have the potential to work for anyone. So I want to share, it lights me up to share. You can practice with me here, anytime: http://www.yogisanonymous.com I always try to emphasize the “how of healing” when I teach. There’s no better feeling in this world that I know of, than the feeling of lifting someone else up. Of lending a hand, an ear, a shoulder, whatever you’ve got. Yoga was no “magic bullet”, and I don’t believe there is one when it comes to healing yourself. So far I’ve been practicing over 20 years, 6 days a week. I’m not done yet, and I don’t believe we are ever done. We are always in process. But knowing yourself and healing yourself are essential pursuits if you want to be happy, at peace, comfortable in your own skin. If you want to be aware of what it is that gives you a sense of purpose and fills your whole being with YES, so you can spread that yes wherever you go. I feel all of those things now, but I certainly didn’t when I started this journey. It’s painful, lonely, uncomfortable work sometimes, but it is totally doable and also necessary if you want to realize what you know. And it does get easier. For me, personally, I’d been in therapy on and off for quite awhile when I started practicing yoga. I have always found human behavior fascinating and intriguing. And like most humans, I’ve always wanted to be happy. In my experience, working with a great therapist can be very enlightening as far as identifying your “stuff”, or going through your baggage. (It might not be for you. Again, I’m just sharing my own “how to unpack story” in the hope that it may be helpful). A good therapist can help you put everything on the floor and sort it out, so you can start to figure out why you do the things you do. And how old stuff might be at play in your present. Part of being at peace is knowing yourself, understanding what makes you tick. It’s like having a trustworthy person hold up a mirror and kindly say, “Can you see what you’re doing? And is this serving your higher good?” So, I’d say I had that information about myself when I took my first yoga class. If we’d met and you’d been interested, I could have told you about why I was the way I was, but I couldn’t have done much about it. And I was not a very happy person. I was actually pretty serious and somewhat depressed. Numbed out. I was attached to my stories, justifications and rationalizations. I had my rage and my finger-pointing. I was a young adult, after all. And I liked my story, it was comfortable. Kind of like an old sweatshirt you just won’t throw away. And I also had no real sense of what made me happy. What I was doing here. So I started to work on that on my yoga mat. My practice became a place where I did my best to feed a loving voice. If I fell out of a pose, or felt sluggish, and that harsh inner critic started piping up, I’d say, “No. Not here. Go away.” And I’d give myself a break, and try to replace the harsh thoughts with some kind and compassionate ones. I focused my mind again and again on my breath. And little by little my mind quieted and I started to understand what a loving inner environment felt like. Sadly, it’s not natural to most of us. We are inundated all day long with messages about how we are “wrong” in almost every way. How we don’t look right or smell right or feel right, or dress the right way, or live in the right house, or drive the right car, or sleep next to the right person. It’s kind of insane. As I started to strengthen that loving, kind voice, I found it followed me into other areas of my life. I realized I’d had blinders on, for a long time. I’d been so fixated on my life, on what wasn’t working or hadn’t happened yet. On why I wasn’t happy. It was a me-focused life, and in retrospect, that’s kind of sad. Because if you really want to be happy, you need to turn your attention to spreading some love and some light wherever you go, whenever you can. And once you tap into that enormous, limitless well of love within you, you will naturally want to share it. To plunge your hands into it and fling it all over the place with abandon, with joy. 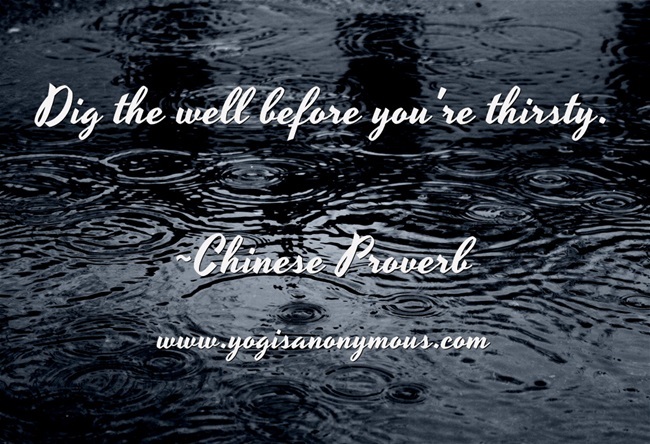 In almost every pose we do in yoga we are “rooting down” and “rising up”. Whatever is touching the floor is rooting down and how we balance ourselves on top of that foundation and breathe is really when the yoga happens. We don’t always stand on our feet. Sometimes we stand on our forearms or our hands or our sit bones. We keep looking at things from different perspectives, balancing ourselves, breathing in and breathing out. The same can be said for life. If you want to rise up, you are going to have to root down and get real with yourself. A structure is only as strong as its foundation. If your foundation is built with denial or rage or bitterness or laziness, it’s only a matter of time before the whole thing collapses in on itself. In order to blossom into the you that has been waiting, your authentic self, you have to be willing to unravel, to unlearn, to un-think, and to unhook your journey from past experiences so you can be free to set a new course. There is an element of destruction. You do away with those things that block you from moving forward, and prevent you from letting go. Sometimes people stand in the wind, contemplating a new way of being. We like our routines in life. We prefer to keep the seed of our being hidden, even from ourselves. 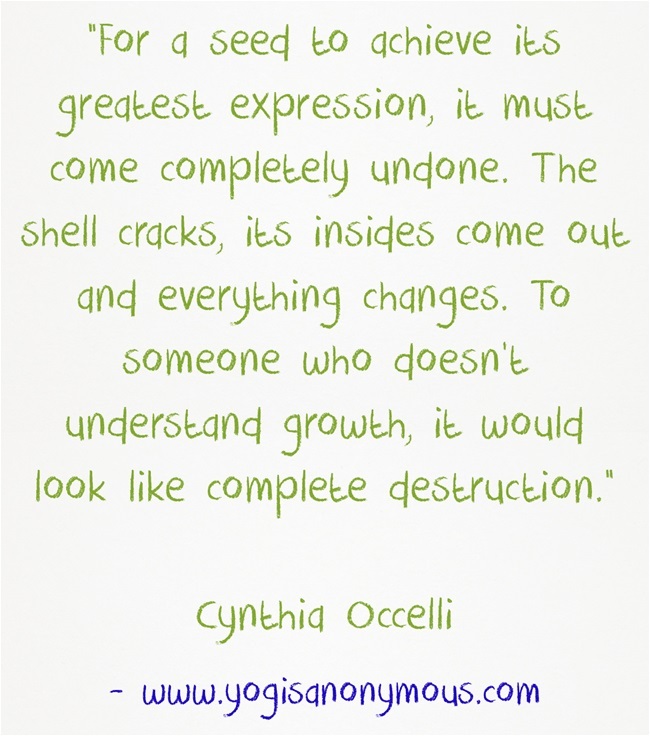 But if you want to be at peace, you had better be willing to unlearn everything, and crack your seed open. Crush to the wind those ideas and ways of being that were never yours in the first place. That’s where the growth happens. You have the seed of beauty within you. The seed of love and compassion and kindness. The seed of your own truth. Plant something that is yours alone, and rise up toward the sun, beyond the sun, add your spark to the limitless universe, why don’t you? Sending you love, a shovel, and the strength to deal with your fertilizer for awhile. You’re going to grow a gorgeous flower if you can hang in there and breathe. You know what’s funny? The past, present and future will show up everywhere with you if your mind is running the show, because the mind LOVES time travel. And it prefers the past or the future to the present. We humans are supposed to be elevated because we can reason. But we are so great at screwing it up. We’re like a bunch of talking heads. Blah blah blah. I believe a mind that is serving your heart and your intuition can be a beautiful and powerful tool. You can use your mind to answer questions like: How do I put my dreams into action? How do I face my fears? How do I have this painful conversation, what is the best way to go about it? What actions can I take to make a difference, to bring more fulfillment and purpose into my life? What tools or methods appeal to me, how do I go about this journey of healing, of quieting, of discovering? But in order to function optimally, we have to be able to quiet the mind, so we can hear that voice that knows the way. Our intuition can chart the course to our purpose, fulfillment and joy if we have the courage to follow it. Otherwise, the obsessive, redundant nature of the unchecked mind will spin us right out of the joy, wonder, beauty, pain, love, anger, confusion, grief, laughter and connection that is ONLY available in the present. That stuff is the juice of life. Without it, life is a painful process of change and darkness, fear and anxiety, confusion, depression and longing. Because usually when we visit the past we do so with some sadness or regret or desire. If we’re revisiting a person we’ve lost, the memory may be happy, but the resulting feeling will be the thud of grief that lands on the heart and renders us breathless. (And please don’t misunderstand me, I believe in remembering those who have been taken from us too soon. I just don’t think they’d want us to live in that space of pain and heartache for too much of our present. I believe they’d want us to find the joy again, and to open to love). And when we think about the future we do so with anxiety or fear, or craving. We might have a vision of how we want things to be, and then feel frustrated or dissatisfied with how things are. I’m going to say something that I feel is left unsaid too often. There are certain losses that will never fully heal. If you’ve endured a loss like that, then you know what I mean. I’m not talking about the break-up of a relationship. I’m talking about the kind of loss where your heart and mind scream with the pain of, how do I possibly face this? All that can be hoped for in those extreme cases is the discovering of a new normal, where a certain amount of sadness is present, more so on some days than others. And hopefully that sadness will lead to greater compassion and understanding for ourselves and others. But allowing yourself to move through life as the servant of your mind is a sure way to be absolutely miserable. If your body (which is your home) were a building, the un-mastered mind would be the top floor, and there’d be about 900 people up there, running around in circles, arms waving, holding files full of thoughts, judgments, ideas, shoulds, can’ts, why’s, and worries, screaming at each other. With harsh lighting, and windows that don’t open. The heart would be right in the center of the building. Quiet, with huge, floor-to-celing windows, a beautiful breeze blowing in, and the most extraordinary light. No yelling, no people, just a presence, just a voice, just you. Or me. Or any of us. Because that spark lives in all of us. In the basement, you have storage. File cabinets full of every experience you’ve ever had, some marked “awesome”, some marked, “heartache, betrayal, loss”, some marked, “rage, jealousy, moments I wish I could do over”, some marked, “really unhealthy choices”. There are no windows in the basement, and there’s no light, because there’s no potential in the past. The 900 people on the top floor love to race to the basement and grab files to run around with. They might pass by that peaceful, quiet, truthful floor of the heart, because it can be uncomfortable to face reality as it is. To come into the now. To realize how extraordinary you are. To take responsibility for your own peace, even if it’s the peace of enduring what cannot be changed, and healing where we can heal. The view from the heart is so expansive, sometimes it scares people and they go running for the basement. But when the heart takes over, it is a gorgeous thing. Because you know what the heart does? It goes upstairs and fires almost everyone. The most efficient person will remain to keep things organized. Two or three others may be left behind, but they’ll only be able to cause a minimal amount of trouble, and only on really challenging days. Mostly, the heart will be able to shush them easily. Then the heart goes to the basement, and sets fire to all those old files. Except for two or three very special entries that may need to be protected. And then the heart goes and sits by that open window, with the breeze blowing by, and watches the whole world unfold with new eyes, with relief, with, Yes. Finally. 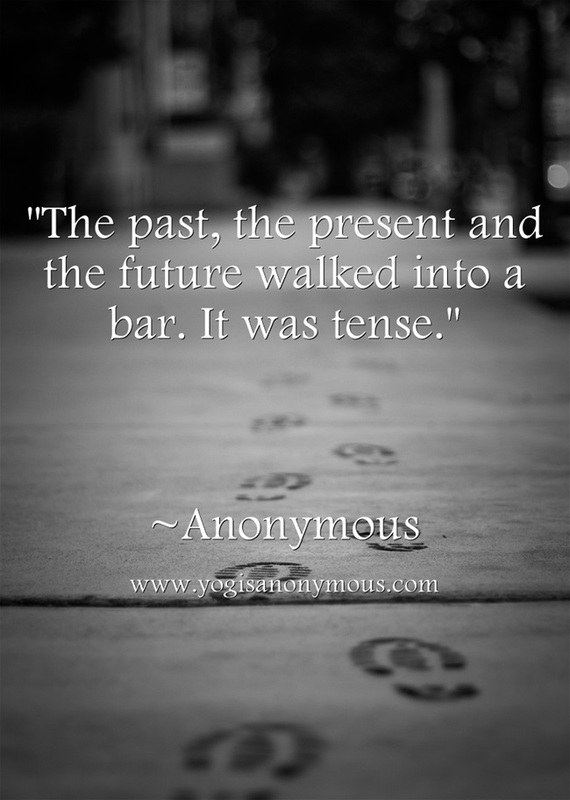 Posted on October 23, 2012 Tags change growth love4 Comments on Are You Tense?